Shirley Vangeloff, owner of Vangeloff Management and an active member of AKFCF (Association of KFC Franchisees), is in charge of 17 KFC franchise locations in the metro Detroit area. Vangeloff Management is in the process of remodeling its restaurants, consistent with corporate KFC directives. They wanted new signage to reflect their new and improved dining and menu experience, that would better attract customers while increasing both unit sales, as well as revenue per sale. Vivio’s II food & spirits is a sports bar in Warren, MI that features a full bar with their world famous Bloody Marys, 26 beers on tap with rotating craft brews, as well as a menu loaded with home-cooked comfort foods and daily specials. When they were looking to revamp their image, showcase their new menu, advertise daily specials, promote upcoming events, and live music on the weekends, they looked into upgrading their sign out front. Simply Fresh Market is loaded up with healthy eats. This amazing store sells organic food and produce with excellent quality. Not only does Simply Fresh Market have tons of food and produce, but they also have their own menu of sandwiches and pizza. 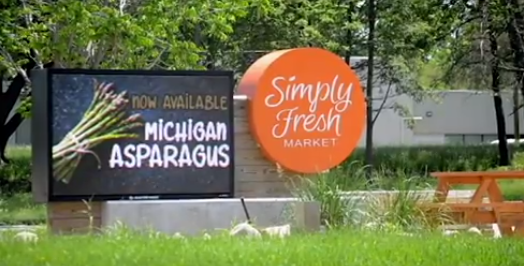 With such a great product and service offering Simply Fresh Market needed an LED sign to communicate their wide product and service offerings. Electro-Matic Visual and Image 360 of Brighton were able to complete the job with a 11mm Fusion LED display. After the installation from Image 360 of Brighton and the Fusion LED display from Electro-Matic Visual, Simply Fresh Market was able to see a significant increase in traffic and uplifted sales. Simply Fresh Market takes full advantage of their full-color 11mm LED Fusion display. They use high engagement content that looks great on their display that attracts the eye of passing traffic. The use their LED sign to promote their newest goods, menu items and any sales that might be going on. This great 11mm LED display will provide Simply Fresh Market the opportunity to continue to drive more customers through the door for years to come. 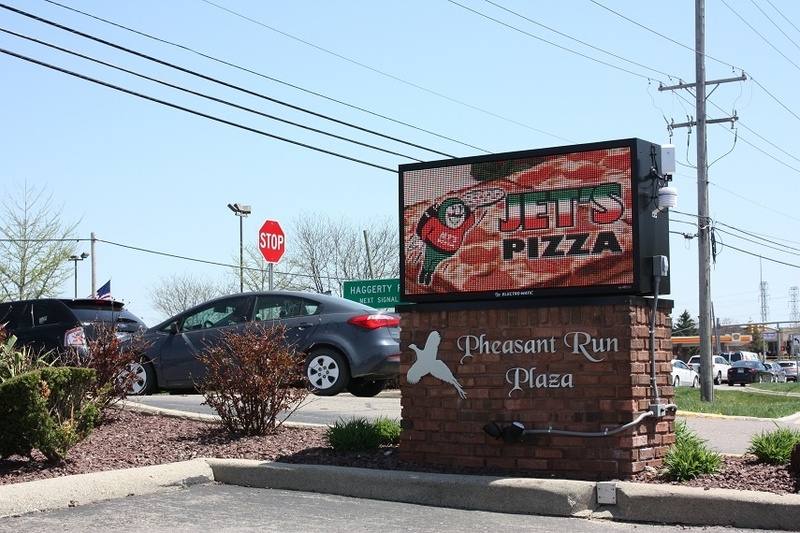 Pheasant Run Plaza in Farmington Hills, MI resides on a high traffic street making it an ideal candidate for an LED sign. The plaza has a great balance and is home to several big chain restaurants and other local business and restaurants and made a perfect fit for installing an 16mm Fusion LED display. Before the new LED sign was installed, Pheasant Run Plaza had a static sign that could only advertise the name of the plaza. Now with their new Fusion LED Sign from Electro-Matic Visual they can inform the passing traffic about what businesses are actually in the plaza. Not only can they inform what businesses reside there, but they can also promote any weekly specials, deals, or promotions for any given business. The tenants are also loving the new Fusion LED sign. It gives them an opportunity to advertise their newest products and promote their services at their convenience. 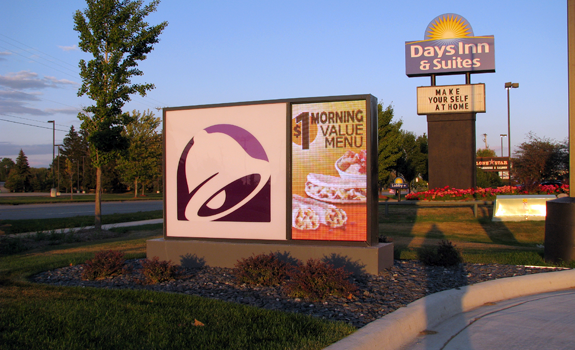 Taco Bell of Mount Pleasant, MI upgraded their signage with an 11mm Fusion LED Sign from Electro-Matic Visual. Taco Bell is constantly changing their menu, promoting value deals and adding new products. Having an LED sign promoting 24/7 and creating exposure to passing traffic increases their success with any of their product or menu offerings. Taco Bell’s new 11mm Fusion LED is extra appealing with how they integrated it with the back lit Taco Bell static sign. Typically, we see LED signs that are stacked below or above a back lit cabinet and here we see this great looking LED sign stacked next to the Taco Bell sign cabinet, creating a very simple and clean looking sign. The Fusion LED Display from Electro-Matic Visual gives Taco Bell the opportunity to display eye grabbing, full color content to promote the $1 Morning Value Menu, $5 Crispy Chicken Quesadilla Box, online ordering options and much more, giving them a competitive advantage over dull static signs. Creative, full color, content helps this Taco Bell stand out from sorrounding competition. Attractive, short, but to the point messages allow passing traffic to be more attracted to the LED display and better chance they stop in. 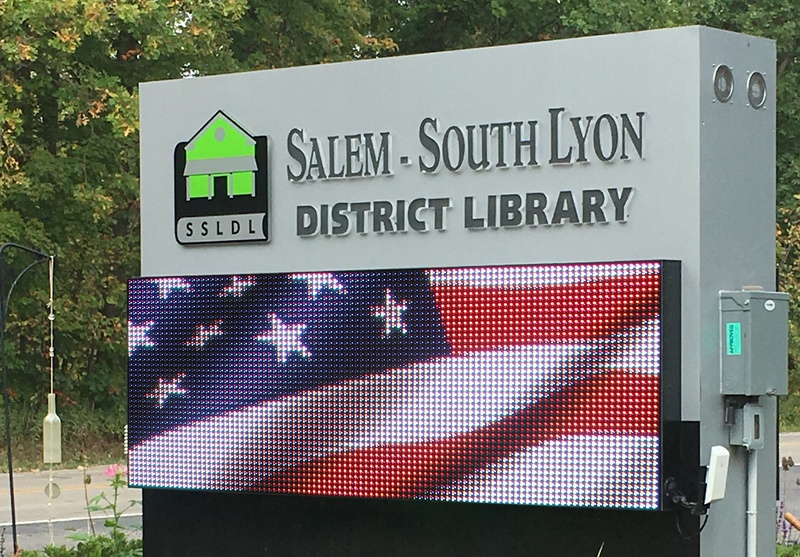 The Salem-South Lyon District Library in South Lyon, MI is focused on educating, enriching, and empowering their community. More specifically, empowering the community to utilize SSLDL’s services is a goal they strive for on a daily basis. With their new Full Color LED display from Electro-Matic Visual they will be able to inform the community about the numerous events that they hold every week. Being involved in the community by offering classes and events is just an example of what the SSLDL does to support and make a difference in their community. Now with the help of their LED display, they can now be more efficient with informing their community on what events and classes are taking place. Passing traffic will see incredible, eye catching colors that will tell them the date, time, place and custom picture to communicate their message. In addition to their events and classes they offer, SSLDL also has a unique digital library that gives people access to a number of digital books and audio books. With their new LED display from Electro-Matic Visual and the ability to have custom content, SSLDL is able to make this unique feature known to their community and it ensures that people will take advantage of the offering. Century 21 located in Marshfield, WI previously had an LED digital display, but with an unfixable large malfunction the LED sign was out of commission. In need of new LED display Stratford Sign Company and Electro-Matic Visual were able to replace the old LED display with a new Fusion LED display. Stratford Sign Company looked no further than Electro-Matic Visual, who had just released their high quality Fusion LED display. With perfect timing Stratford was able to install this 11mm sign instead of the originally planned 16mm with minimal price difference. The upgrade to an 11mm pixel pitch will benefit Century 21 as they plan to show off their excellent inventory of houses to passing traffic. With a better picture, the detail of the houses will be more impactful to passing traffic. KFC Corporation was started more than 70 years ago and it all started with a single cook that created the world famous recipe. Today, KFC is in 125 countries are territories around the world. 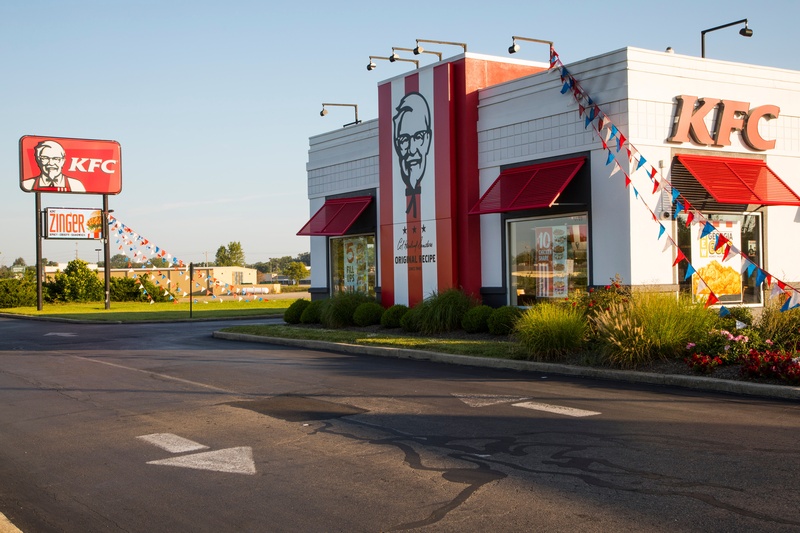 As KFC is evolving, this particular KFC franchisee located in Trotwood, OH wanted to upgrade their static sign to an LED sign to promote new menu items, home style sides, buttermilk biscuits, catering, and of course their world famous chicken. As the restaurant was being remodeled, it seemed like the perfect time to add Electro-Matic Visual’s electronic digital signage to the marketing mix. Since the installation of their new electronic message center KFC has been seeing some wonderful results. Beyond an overall increase in revenue and profit margin that exceeded their expectations, they now have the ability to effectively promote other elements of their business, such as the catering services they offer that they had a hard time doing with their old static signage. Weathervane Heating and Cooling, Inc. of Howell, MI is known for their high quality, “Luxaire” Heating and Air Conditioning units and their professional knowledge on heating, cooling, and ventilation. Weathervane offers the highest level of home comfort by consisting of efficient, reliable and cost effective products and services. Much like Weathervane’s foundation, Electro-Matic Visual’s LED displays proved to be the right fit because it matched the high level of efficiency, reliability, and cost effectiveness and with the help from Image 360 the project was able to be completed. 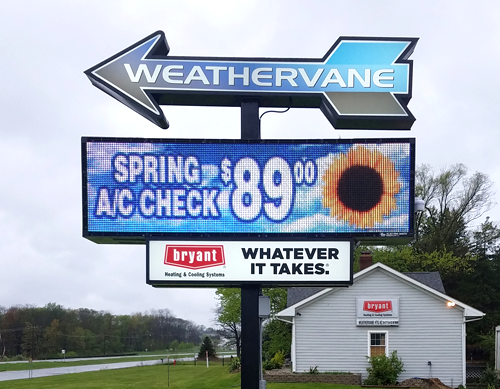 Image 360 and Electro-Matic Visual were able to give Weathervane this attractive sign to help them reach the traffic driving by. Their location sits well above the road and it was previously harder for people to identify what exactly the building was on top of the hill. Now with their new LED sign they are able to communicate with passing traffic to promote their “Luxaire” Heating and Air Conditioning units and their best service offers. Not only are they able to promote deals on products and services, but now their sign can help build their brand image and professionalism that they have.